Novas are explosions on the surface of white dwarf stars. They're the little siblings of supernovas, lasting mere days and emitting far less energy — but apparently still enough energy to emit gamma rays, in a development that's baffled astrophysicists. White dwarfs are the degenerate remains of a star that was too small to explode in a supernova. White dwarfs are incredibly dense - the average white dwarf has the mass of the Sun but the volume of Earth. Our Sun is a future white dwarf - when it runs out out hydrogen in five billion years, the Sun will live on for maybe a quadrillion years as a white dwarf. That's about a million times the current age of the universe, and that might actually be the lower limit for how long these stars last. During their unimaginably long existence, white dwarfs sometimes gain another star as their companion. If that other star is big enough and close enough to the white dwarf, it starts pumping hydrogen gas onto the surface of the white dwarf. The intense gravitational fields on the white dwarf compresses and heats up the gas, eventually causing a runaway nuclear fusion. This explosion causes the white dwarf to temporarily become incredibly bright, although it quickly reverts back to normal in a matter of days or weeks. It's a fairly common event, with an estimated 40 or so novas occurring every year, and astronomers thought they had novas all figured out. 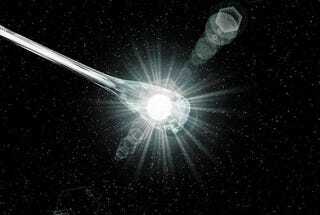 That was until NASA's Fermi Gamma-ray Space Telescope detected a spike in gamma radiation that could only have come from the white dwarf V407 Cyg. Gamma rays are the most energetic form of light, and the energy levels needed to create them were thought to be way above what a white dwarf could produce during a nova explosion. V407 Cyg forms what's known as a symbiotic binary with a red giant star that's a whopping 500 times the size of the Sun. The red giant vents immense amounts of hydrogen into space - it produces enough hydrogen every decade to equal the mass of Earth. It's likely that that unusually massive amount of leaked hydrogen created the huge nova explosion, which caused V407 Cyg to reach magnitudes 10 times brighter than normal. The nova blast created what's (awesomely) called a shock front, which is a dense outer shell composed of ionized gas, magnetic fields, and extremely fast-moving particles. Those particles were trapped by the magnetic fields and whipped up to velocities approaching the speed of light. When those near-lightspeed particles hit the red giant's solar wind, gamma rays were created. "We know that the remnants of much more powerful supernova explosions can trap and accelerate particles like this, but no one suspected that the magnetic fields in novae were strong enough to do it as well." The explosion, dubbed Nova Cygni 2010, isn't just a cosmic curiosity. It also allows astronomers another vantage point from which to observe how gamma rays get created in the wake of stellar explosions. While supernovas last for as much as 100,000 years, this nova will only another few days at most, which allows astronomers to observe the process on an extremely compressed timescale. As one researcher notes, it's like going "from a photo album to a time-lapse movie."